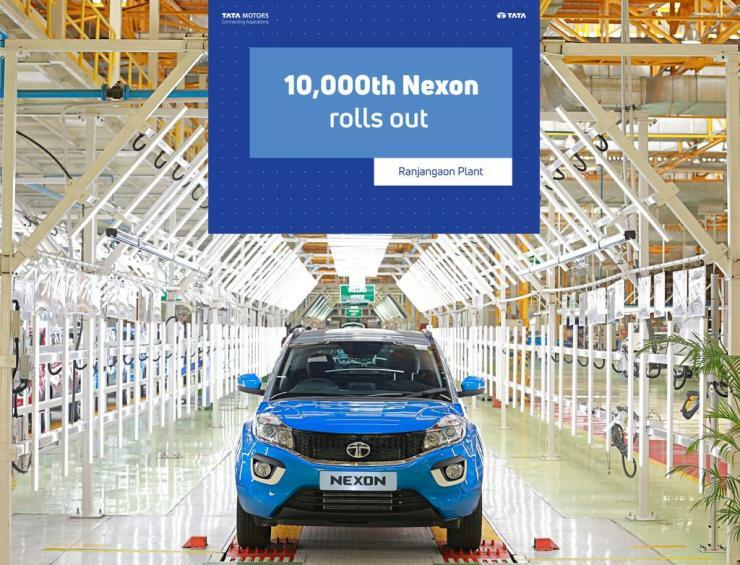 In 4 months, Tata Motors has produced 10,000 units of its latest product for India – the Nexon compact SUV. The Nexon competes with the Ford EcoSport and the Maruti Suzuki Vitara Brezza. However, it does not sell as well as these vehicles as Tata Motors is not able to produce enough of the Nexon despite having a lot of pending bookings. Tata plans to increase production of the Nexon. Once that happens, we may see the Nexon neck and neck with the EcoSport in terms of sales. The Brezza is a different matter altogether, as it sells more than 10,000 units each month. To boost sales, Tata will not only increase production but also introduce AMT option on both petrol and diesel variants of the compact SUV. The automated manual transmissions on both the engines will make the Nexon a segment leader as no other SUV in its class offers automatics on both petrol and diesel. The Nexon is powered by a 1.2 liter turbocharged petrol engine with 108 Bhp and 170 Nm. This 4 cylinder engine gets a 6 speed manual gearbox currently. It also features Multi-drive modes that allows it to operate in Economy and Sport modes. The diesel engine of the SUV is a 1.5 liter-4 cylinder unit. It gets outputs of 108 Bhp and 260 Nm, making it the most powerful engine in the sub-4 meter compact SUV segment. Like the petrol engine, the diesel also gets multi-drive modes. It gets a 6 speed manual gearbox as well. The Nexon is one of the most stylish compact SUVs on sale in India. The styling makes it look more sleek than butch. On the interiors, Tata has given the Nexon a couple of premium features – a sliding glovebox and a floating infotainment system. The compact SUV also gets an 8 speaker stereo from Harman. It is the best priced sub-4 meter compact SUV, with prices starting from Rs. 5.85 lakhs.